In a small bowl combine the ingredients for the vinaigrette. Whisk until thoroughly combined. Or place all ingredients in a jar with a tight fitting lid, and shake well. 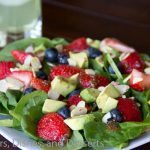 Top a bed of spinach with avocado, strawberries and blueberries. Sprinkle with almonds. Drizzle about 2 Tbls of vinaigrette over spinach, for 1 salad. Store extra vinaigrette in the fridge for up to 5 days.